Playing against better players - a good way to tennis improvement? One of the best ways to improve in tennis is playing against better players. I have been fortunate to find players of various levels to play against, and that really helps me FINE-TUNE my game. But there are some things to take into consideration when you are up against better players. Playing against better players will get you to adjust towards a higher tempo. This will quickly unlock flaws in your own game. 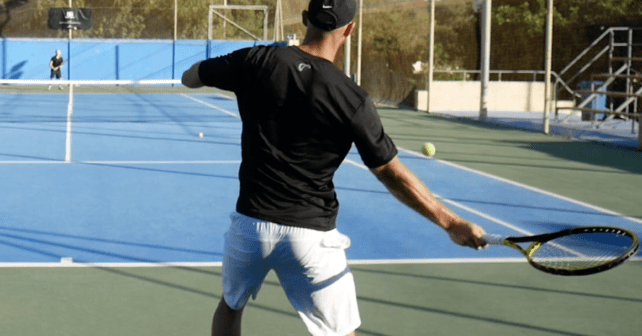 If I take my most recent experience against ITF player and tennis coach Lance Dugan (see video from our hit below), I again noticed that where I most often end up late is on my backhand preparation. So instead of hitting through the ball with my weight forwards, I tend to lean backward. On slower balls, I do not have this problem as much, but when the tempo and spin increases, it becomes evident that I need to do more work on that wing. There are other things that pop up as well when you are the weaker player. In my case, I tend to stress the points against better players, going for too much too soon. It is partly because I overestimate how punished I will be with a weaker or safer shot. It is also partly the fact that this is how I want to play tennis, take the initiative as soon as I have the opportunity. But playing for the lines from poor positions on the court is simply not smart. There are not many downsides to playing better players, but there is a psychological factor you need to be wary of – your confidence can take a beating. When you are playing weaker or even level players, if you play really well, you feel really good about your game. Playing well against a better player will in most cases still have you feeling a bit low about your tennis game. No matter how much fun it is and how realistic you are about your own game and its weaknesses. That is why constantly playing better players can be detrimental to your own competitive tennis, at least in the short term. Tennis, like all sport, is all about confidence and believing in your abilities. And that belief can really take a hit when you play someone a level or two above you. I have some more videos on this experience on my YouTube channel. This is also a case for sometimes playing match and points play against weaker players. It might not grow your game technically as much as you would against better players, but it builds your confidence and gives you the feeling of winning matches. So be a bit careful about going on a losing streak if you are consistently playing better players. One of the best ways to become a better player is playing against better players. Your inspiration to improve increases, you see flaws in your own game and can study characteristics in the better players’ game. However, be a bit careful, because too much of that can damage your confidence and make you too critical of your tennis when it is time for match play. You need to build your strokes and technique, but almost as important is growing your confidence. At least if you want to be successful in competitions on your level. Here is my most recent video of my practice session and points play against tall Aussie Lance Dugan. Lance came to Malta for one day on his way to Futures tournaments in Tunisia. We met up for a hit on a sunny morning and I had a blast despite not being my best. Lance is a really nice guy and a good player with clean technique and a monster serve. Some years back he was a top 100 player in Australia, but severe health issues stalled his career. Now he is back and trying to make a push on the tour. I wish him all the best on his upcoming tournaments. What are your thoughts on playing better players? Is it something you normally do and do you hit with the same players over and over or do you mix it up?